....wow...we have been having some crazy fun here at ARTful Salvage. We have been putting on our repurposing hats and going to town. We have several new pieces to share! I can't wait to hear what you think. They are all listed in our Etsy shop. Please stop by and let us know what you think! Mirror mirror on the wall.....who's believing? We found two really nice mirrors to etch. I actually used the same for both, since it makes me happy. Guess I can do that 'cause it's my shop, huh? LOL I chose to etch the word, "Believe" because I do, believe, and I bet you do too. It works for whatever or whomever you choose to believe in. The first frame is a more formal brown rectangle frame (The mirror is approximately 19.5" x 10.5"). The second is a bit more rustic and black (The mirror is approximately 11" x 22"). Whichever you choose, it will make a great statement in your home or garden. Anyone up for some disco? Want to add some serious shine and bling to your garden. We have just the perfect thing...a repurposed bowling ball turned gazing ball. 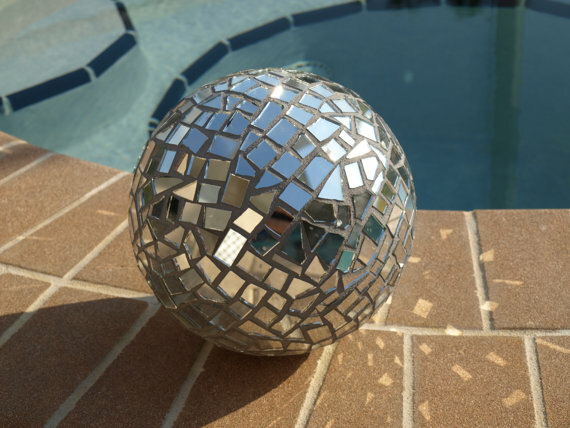 This one is special, as it is created completely with mirror pieces. It literally is stunning when the sun hits it. All the gorgeous colors of your flowers and garden are beautifully reflected. It is by far my fave gazing ball I have created. Well look no further than ARTful Salvage......we currently have 10 flowers, sure to be ever-bloomin'. Any color you can imagine, can be found in our Forever Garden. Here are the two newest members. If the chicken feeders are quite your style and you want an even prettier way to feed your feathered friends.....look no further than our repurposed vintage light fixtures. These are very unique and hard to find. Each one is a piece of ART. 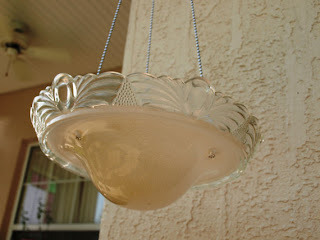 We add beaded chain and a hook so they can be hung anywhere you choose. 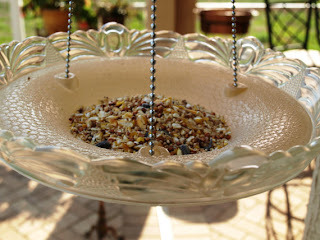 And you don't have to stop at feeding the birds.....they work equally well for your favorite plant, holding a candle, the mail, anything you desire.